Freshly installed pair of Kyocera 130W solar electric panels on Art Miller's Airstream in front of the "Oasis" office. Solar power, and sometimes wind, are a natural addition for your RV or boat. Since you are already set up to run 12V, it’s very easy to place one or more modules atop your camper for additional battery charging. These systems work as well on the roof of an RV as they do on the roof of your remote cabin. We can design any size system for your RV or boat—the only limit is the amount of space on your roof. Since batteries are charged when traveling, RVs normally depend mostly on the vehicle’s alternator for the primary power source. Power to charge the battery is also provided through a converter when plugged into regular utility or ‘shore’ power. But for those folks who like to spend days or weeks (or longer!) neither traveling nor plugged in, photovoltaics can mean freedom with plenty of power. It can also mean peace and quiet—especially if you do not have to run your generator. 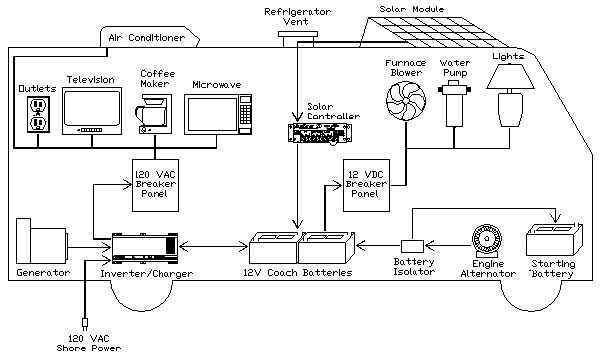 Also, an RV’s battery bank and fuse box make installing a solar power system easy to do. If you cannot do it yourself, your RV shop is generally glad to do the installation for you, as can someone with general ‘handyperson’ skills. Many of our RV systems use one or two modules—but like any other power system it’s important to analyze your power needs. You will need to consider the wattage of the appliances and lights you want to power as well as the average hours of use each day. Unlike a stationary power system though, RVs travel through different sunshine zones and park at varying angles to the sun, sometimes in shade, sometimes not; people with the same RV can have very dissimilar power usage. These factors must be considered—if you have questions, do not hesitate to give us a call. 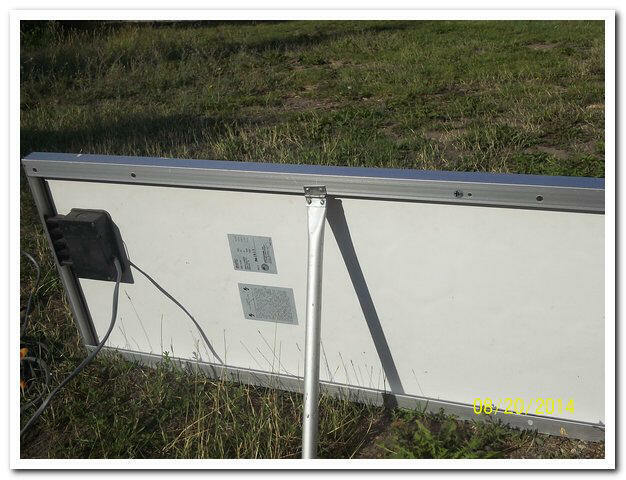 When you flush mount your solar modules on top of your RV, it is not always properly angled for optimum solar input. Many people prefer to park in the shade and put their solar module in the sun. This ancient 70W solar module keeps our coach battery charged in our old Dodge van, so we have a fridge, fan, lights and music on demand. If you are considering the addition of solar power on your rig, give us a call. You can see in this picture (right), a simple hinged metal leg allows you to place the solar module where preferred, and move it around a couple of times during the day to keep it angled perpendicular to the sun's rays. Your battery charging depends on the intensity of sunlight and exposure to time in the sun. A sunny day can really sock some power into your batteries—and you’ll get some charging on cloudy days, though at a lower output. Also, solar modules provide a daily maintenance charge to help protect your batteries, as sitting idle for several months can be permanently damaging to them. For marine use, the addition of a small wind generator may be even more cost-effective than solar, as oft times there are very windy conditions on the water. Call or e-mail us if you are thinking about adding solar or wind power to your RV or boat; 406 777-4309. For a more general overview of how the different components work together click here.